Provides parameters and methods for randomizing and tweaking LocalizationParticles. Definition at line 41 of file LocalizationParticle.h. Reimplemented from ParticleFilter< ParticleT >::DistributionPolicy. 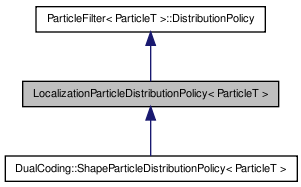 Reimplemented in DualCoding::ShapeParticleDistributionPolicy< ParticleT >. Definition at line 44 of file LocalizationParticle.h. Definition at line 43 of file LocalizationParticle.h. Definition at line 54 of file LocalizationParticle.h. Definition at line 69 of file LocalizationParticle.h. Definition at line 59 of file LocalizationParticle.h. Definition at line 49 of file LocalizationParticle.h. Referenced by LocalizationParticleDistributionPolicy< ParticleT >::randomize(). Definition at line 46 of file LocalizationParticle.h. Definition at line 48 of file LocalizationParticle.h. Definition at line 47 of file LocalizationParticle.h. Definition at line 51 of file LocalizationParticle.h. Referenced by LocalizationParticleDistributionPolicy< ParticleT >::jiggle(). Definition at line 50 of file LocalizationParticle.h.